What insired you to get involved? I am a Korean American adoptee who has been able to gain the kind of education that many females cannot access. Because of my education, I live as an independent woman, I feel confident about who I am as a global citizen, and I am able to help people. I want every young girl to have the opportunity to reach her own self-fulfillment in her lifetime. Isatou lives in the village Kankuntu. At 6 years old, she works very hard. Each day, she uses a small hand broom to sweep the large porch in front of her family’s compound. She also helps her mother cook meals over a fire, chopping vegetables in her hand and pounding spices. She washes the dishes and clothes next to the water tap outside. And she watches over her grandmother, who especially needs help with keeping the chickens, goats, and cats away from her food bowl. Isatou tries to learn whenever she can. 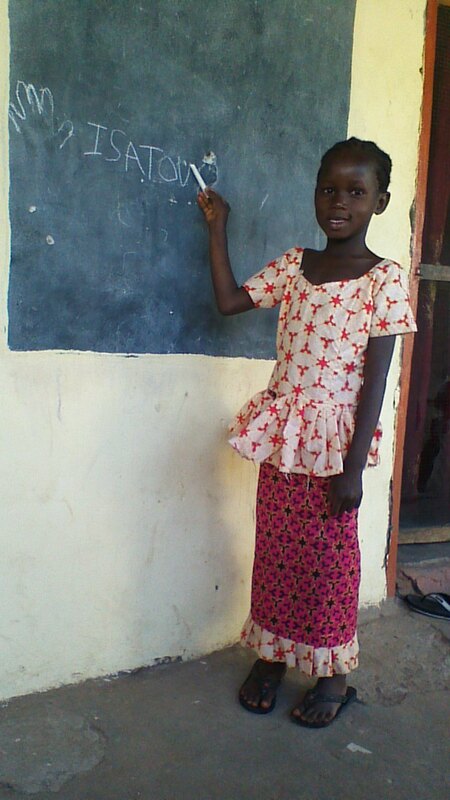 Until we started supporting her last year, she had never attended school, but she was often found writing and drawing on a chalkboard painted on the outside of her house. 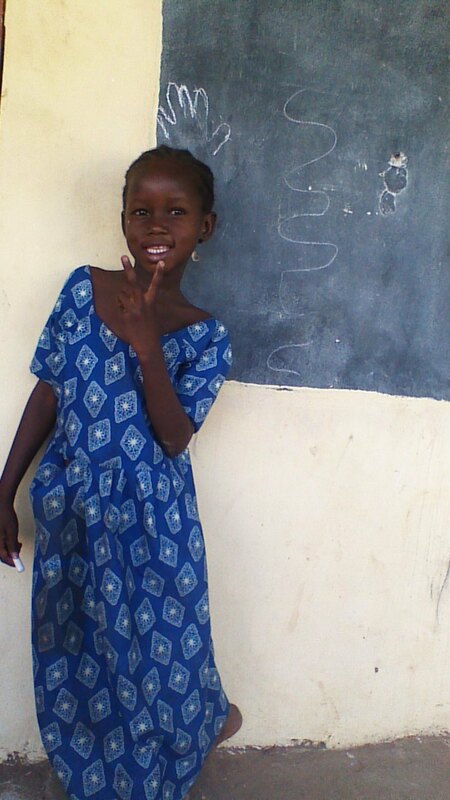 Isatou likes Math; even before starting school, she could count to 25. She knew the entire English alphabet too. And she enjoys Reading. Her favorite book is about a boy who falls asleep under a large tree where many different animals come to visit him. Istaou has little free time and few toys, yet she finds ways to have fun. She sings and dances throughout the day. In the evening, she likes to teach her native language of Mandinka to Volunteers who come from the U.S. and live at her compound. She can beat anyone at cards, and she likes to braid hair. Isatou gives so much to everyone. You can meet Isatou by watching ​this video. And then a video of her this year is here. Please donate to Memi’s GambiaRising fund below so that Isatou can continue to go to St. Edward’s Lower Basic School and so we can help others like her too. Big or small, your help will support girls like her now and in the future. To support Memi and Gambian students, please click the "Add to Cart button as many times as you wish, or adjust the "quantity" at check-out.